Powerful cosmetic ingredients target skin slackening and promote the synthesis of collagen, elastin and hyaluronic acid in the skin. 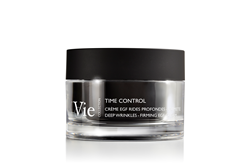 Vie Collection draws its inspiration from redensifying Epidermal Growth Factor (EGF) injections with the new TIME CONTROL Deep Wrinkles - Firming EGF Cream, designed to combat deep wrinkles, devitalization, loss of elasticity, loss of volume and sagging facial contours. EGFs are proteins naturally present in the skin and are able to boost cell growth capability and regeneration by initiating the synthesis of collagen, elastin and hyaluronic acid. With age, the natural concentration of EGFs in the body decreases and signs of aging appear. 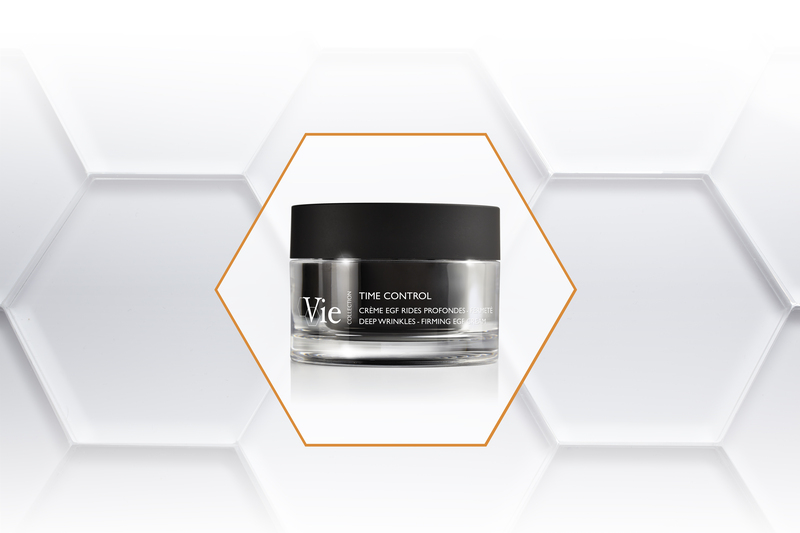 An EGF-Like Peptide is used in this formula to fill wrinkles and smooth and regenerate the skin. Pro-Collagen Peptides target fibroblasts within the skin to trigger a massive production of collagen for a redensified and firmed appearance. Skin is strengthened and recharged with energy thanks to trace elements and minerals infused within the moisturizer. Rich and creamy with a subtle feminine scent with notes of florals, musk and tea, TIME CONTROL is enriched with moisturizing and nourishing ingredients to reduce feelings of discomfort for those with thin and/or mature skin. Directions for use: apply morning and evening to perfectly cleansed face and neck with upward movements. Tested under dermatological control. EGF-Like Peptide - obtained by a chemical synthesis, the EGF-Like Peptide has the same molecular structure as EGF found naturally in the skin. It is attracted to EGF receptors and once connected to them strongly activates cell division. Cell regeneration becomes faster and more effective. Pro-Collagen Peptides - synethetic peptides combined with bio-assimilable spherical particles, all of which has a marked effect on the synthesis of collagen. Each particle is bonded with 200 peptides. All of this together represents a highly technical ingredient used in biological research for delivering active ingredients to cells in a targeted matter. *Measurement of the smoothing and anti-wrinkle effect. Instrumental test on 21 volunteers, after twice daily use. Average value obtained on 13 out of 21 volunteers. Overall result -7%. **Satisfaction test on 22 women, twice-daily application for 28 days.